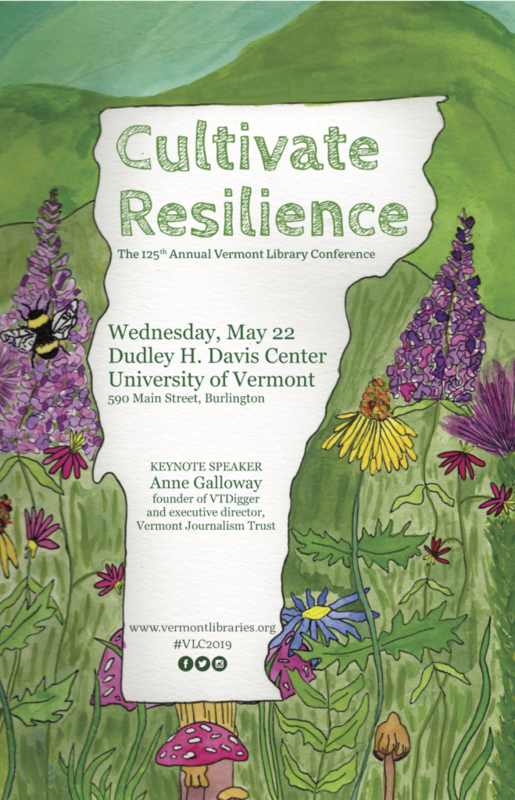 We invite you to attend the 125th Vermont Library Conference, Cultivate Resilience. Join us for a full day of workshops, speakers, panel discussions, networking, vendors, and lunch. Registration is now open. Use the hashtag #VLC2019 to share and follow on social media. View the schedule and program descriptions. We will add slides and handouts to this page when provided by speakers. Anne Galloway is the founder and editor of VTDigger and the executive director of the Vermont Journalism Trust. Galloway founded VTDigger in 2009 after she was laid off from her position as Sunday editor of the Rutland Herald and Times Argus. VTDigger has grown from a $16,000 a year nonprofit with no employees to a $1.5 million nonprofit daily news operation with a staff of 20. In 2017, Galloway was a finalist for the Ancil Payne Award for Ethics, the Al Neuharth Innovation in Investigative Journalism Award and the Investigative Reporters and Editors FOIA Award for her investigation into allegations of foreign investor fraud at Jay Peak Resort. A discussion will follow her keynote address. UVM has limited on-campus parking and requires a one-day permit to be displayed on your dashboard. Please indicate on your registration if you would like to receive a permit and directions by email. Carpooling to Burlington is encouraged. Create or join a carpool at http://www.groupcarpool.com/t/p72gza. Overnight accommodations are available at the Double Tree by Hilton (formerly the Sheraton, 870 Williston Road) by booking online or calling (800) 445-8667 (1-800-HILTONS). Mention the Vermont Library Conference to qualify for a group rate of $115 (plus taxes and fees, see registration page for details). Please reserve your room prior to April 30. Stay tuned for further information on our Tuesday evening pre-conference social. Join your colleagues for a reception on Wednesday following the conference from 5:00-6:00 pm at UVM's historic Billings Library, a nationally recognized architectural landmark that served as the campus library from 1885-1961. In August 2018, UVM Special Collections moved from its basement home in the Howe Library to the second and third floors of Billings and reopened as the Silver Special Collections Library. DEADLINE EXTENDED! Exhibitors and sponsors are now being accepted. Please return the VLC 2019 Exhibitor Sponsor form (PDF, 107 KB) by email to Margaret Woodruff, [email protected]. Exhibit hall tables are $150 and include registration for one (additional staff can register separately). Add sponsorship to increase your visibility to attendees. Every dollar of your sponsorship helps reduce the cost of registration for our attendees. Unable to send a representative to VLC 2019? Sponsorship is a great way to reach our members and participants.